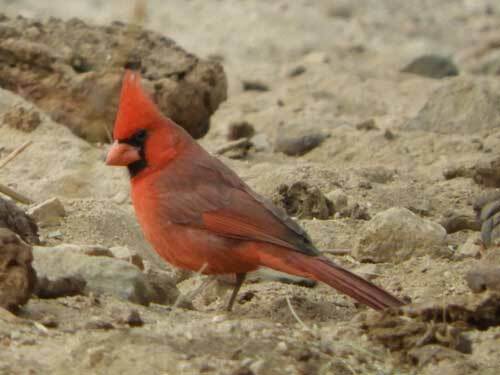 Cardinals can often be found searching for seeds in corrals used for range cattle. Here they find seeds that passed through the digestive tracts of cattle and ended up in their dung. Wickenburg Mts., Yavapai Co., Arizona. 16 Dec. 2017. 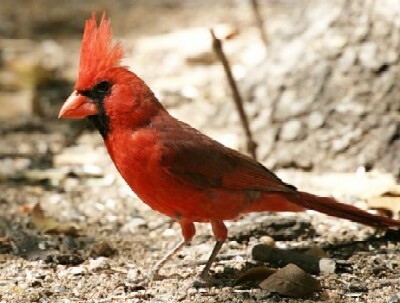 Northern Cardinals are familiar birds across North America. In the Sonoran Desert they are mostly absent from the hottest, driest desert locations. But in the mountain foothills and along wooded canyons they are common and conspicuous birds. So it's not unreasonable that our pro football team is named the Arizona Cardinals. 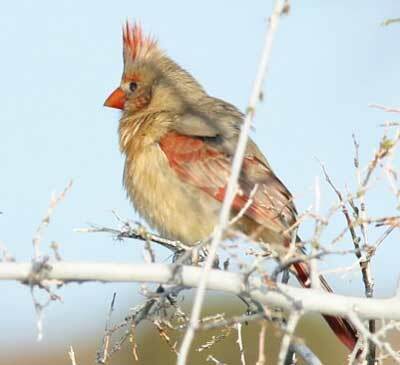 During the winter months cardinals feed mostly on seeds and fruit. The orange berries of Desert Hackberry (Celtis ehrenbergiana), for example, are heavily used. They are not adverse to plucking seeds from cattle dung. In summer they depend heavily on insect prey, especially for their developing young. This female cardinal was photographed by Robert Shantz.